Ecosystems around the world are in a constant state of competition as inhabitants impact each other, whether directly or indirectly. The theory of competition deals with interactions between populations within a defined range or habitat. Individuals with more beneficial adaptations are more “fit” and will often out-compete others for resources like food, territory, or sunlight. Today, we will look at how one species can become dominant over its competitors in wetlands and what conditions might disrupt or completely tear down dominant species. Some of our readers may immediately think of monoculture farming as a sort of dominance, and they would be correct. Although it is through artificial selection, crop species present some trait that Homo sapiens deems worthy of cultivating. For example, huge swaths of land in the United States have been clear-cut to make room for corn farms, cattle ranches, or even sugar cane farms. Maybe not to the same degree as artificial selection, natural selection can also produce habitats with dominant plants and animals. Coastal Louisiana’s wetlands are great examples of this. 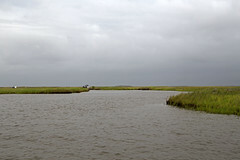 From Cypress swamps to Spartina marshes, wetlands are home to some hardy species who have adapted to harsh and variable conditions. Wetlands go through cycles of drought and flood conditions, which can prove fatal for many species. Wetland plants have adapted to survive the cycles and even exploit them. Cypress trees are a useful example because they don’t necessarily need flooded conditions to grow, they just need space and a little bit of protection when they are young. Instead of becoming competitive on dry land with the thousands of other obligate dry land trees, cypress ancestors developed the ability to survive in water where few other plants competed. More information about their adaptations can be found in our second post about flood stress tolerance. In the salt marshes along our coast, smooth cordgrass (Spartina alterniflora) and other graminoids (grass-like species) dominate with their salt tolerance and fast reproduction. More about how cordgrass and black mangroves dominate other coastal species can be found in our first post about salt stress tolerance. Within a species’ endemic (native) habitat, populations are limited by food availability, competition, and predation. However, species can move to non-native habitats that have plenty of food, less fit competitors, or little to no predation, in which case that species can become problematic. Invasive species are detrimental by definition and coastal Louisiana has several examples, which can be found in our invasive species article. Unfortunately, many invasive species move to new habitats with the help of humans, sometimes by accident and sometimes on purpose. If you want to learn more about how human impact and other factors can change dominance structures, be on the lookout for Dominance pt. 2 next Wednesday!